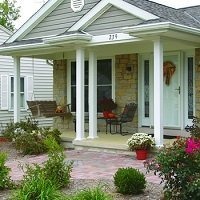 Our Aluminum Columns are prefinished in 5 permanent colors: white, almond, tan, sandstone, and brown (primed option available for those who want to paint a different color). 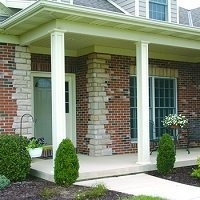 These decorative columns will not rot, crack, or come apart like wood columns and are load bearing with the smallest diameter/width able to bear up to 16,000 lbs. These aluminum columns are easily assembled and installed as lone members or around structural supports, wood beams, downspouts, etc. We offer an assortment of exterior railings and fences to compliment this line. 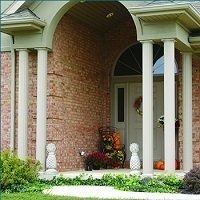 Standard cap/base sets are provided and decorative Scamozzi, Doric, and Corinthian Capitals are available.